Mayor Mitchell Ing of Monterey Park: Tell Sister City, Seoul Yeongdeungpo District, South Korea, That We’re Opposed to the Torture and Consumption of Dogs and Cats. Seoul Yeongdeungpo District became Sister city with Monterey Park in 2007. Yeongdeungpo district of Seoul, the home of ‘shiny skyscrapers’, Hanjin Shipping and LG; it has super-malls, 5-star hotels and – oh so importantly – a self-quoted desire to: “strive to provide a brighter future for a green city exuding vitality and affection”. So let’s ask what the brighter future will be for the dogs in their meat trade. There are countless dog slaughterhouses, markets and restaurants where the dogs, who are tortured their entire lives, end up being slaughtered in the most inhumane ways, such as by electrocution, hanging or beating; and then thrown into boiling water – sometimes while they are still alive. In many places, dogs are being killed in full view of other terrified, caged dogs; and this takes place in public and in broad daylight. In addition, many abandoned and stolen former pets end up in this industry, and are subjected to the same cruelty. This place claims to wish to “focus attentively on the diverse opinions and criticism”, so let’s not disappoint them: please share your opinions and pass on your criticisms – tell them what you think of their dog-meat trade, tell them it must stop. A Search Engine reveals the sickening scale of Seoul Yeongdeungpo District’s dog meat demand. The searches resulted in: 218 Health Food Centers; and 104 restaurants in and around the city of Seoul Yeongdeungpo District alone. Even if half of these ‘Health’ Food Centers and restaurants serve dog and cat ‘ingredients’ in one form or another, just imagine how many dog/cat slaughterhouses must be present in and around Seoul Yeongdeungpo District in order to supply all of these outlets. Please sign petition, call and email Monterey Park Mayor Mitchell Ing, TODAY! Seoul Yeongdeungpo District is one of the largest dog meat consumption areas in South Korea. 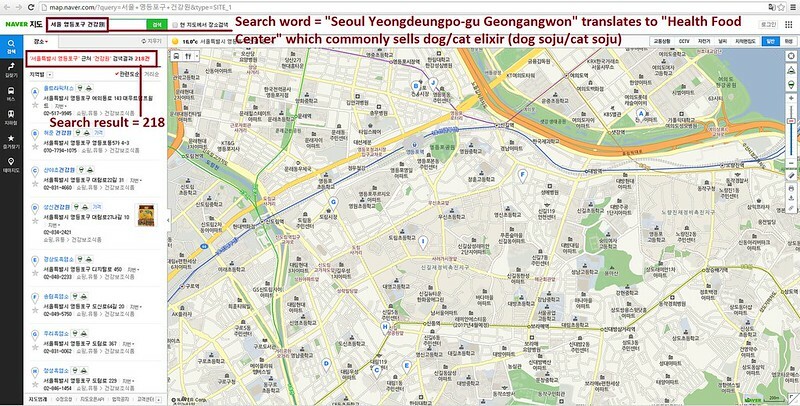 The Korean internet searches resulted in: 218 ‘Health Food Centers’ which commonly sell dog/cat elixirs (also known as dog soju and cat soju); and 104 dog meat soup restaurants in and around the city of Seoul Yeongdeungpo District alone. No matter where you live PLEASE SHARE these actions with your friends – especially those who live in Monterey Park! Stop the disgusting, barbaric trade Now!! I will never buy anything from Korea! I will never visit there! I will BOYCOTT the Olympics there! The fact that it’s illegal to have dogs and cats for consumption is meaningless because the law is NOT enforced. I wish we would take our soldiers out of Korea. I don’t want us protecting you. ONLY the dogs and cats need protection. ALL YOUR SICK PEOPLE SHOULD GET ILLNESSES WITH A VERY SLOW DEATH> EVEN THAT WOULD BE TO GOOD FOR YOU FREAKS OF NATURE!! YOU ARE DISGUSTING Not Worth Anything To Any one . The WORLD NEEDS TO SHUN COUNTRIES LIKE YOURS!!! I will not support anything to do with this country, won’t buy any Korean products until this cruelty is stopped. Let’s be rational, compassionate, moral & merciful — we do NOT live in the Dark Ages — you are a progressive & modern country with a richness & beauty — SHUT DOWN PERMANENTLY this unnecessary, irrational, hateful, heinous, horrific, sadistic, cowardly, immoral, cruel & unconscionable dog/cat meat racket — the suffering & insane treatment inflicted on these vulnerable & innocent animals is beyond the pale — the world is watching — SHUT DOWN THESE HORROR DOG/CAT MEAT FARMS ONCE AND FOR ALL! In this day and age, NO jurisdiction should be selling dog & cat meat, especially a country like S. Korea, a progressive country with a unique richness and beauty. Think of all the tourists who visit unbeknownst to them of this brutally horrific & immoral industry. Think of all the S. Korean products bought by Americans, who are in the dark when it comes to the S. Korean dog & cat meat trade. This industry is insanely cruel, sadistic, needless, merciless, immoral — the unnecessary torturous suffering inflicted on animals is so depraved, it’s beyond the pale — we MUST SHUT DOWN this horrific dog/cat meat racket PERMANENTLY.